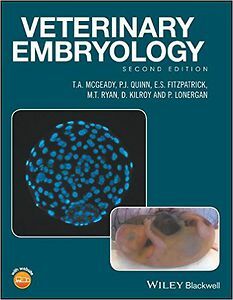 Veterinary Embryology, 2nd Edition,has been updated to reflect the many changes that have developed both in an improved understanding of molecular features of embryology and in the rapid advances in the manipulation of embryonic cells, particularly stem cells. 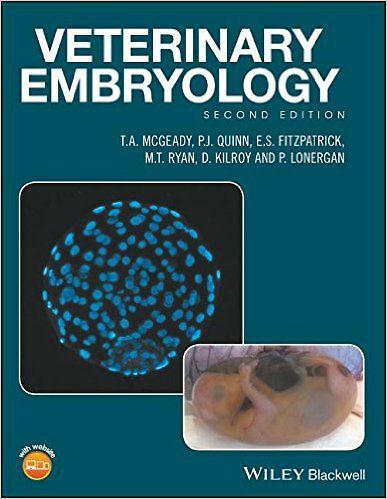 The text is written by an expert team, all of whom have extensive experience in the teaching of veterinary embryology and cognate subjects. Now in full-colour throughout, the text provides information relevant to many subjects taught in preclinical, paraclinical and clinical years of veterinary programmes. Early chapters describe and explain sequential events relating to the division, growth and differentiation of cells and to the formation of foetal membranes, implantation and placentation. Succeeding chapters trace the origin, growth, development and maturation of the major body systems. Age determination of the embryo and foetus is reviewed, as are the genetic, chromosomal and environmental factors which adversely affect pre-natal development. Four new chapters have been added, covering historical aspects of embryology, stem cells, embryo mortality in domestic species and assisted reproductive technologies used in domestic animals. A reading list at the end of each chapter offers additional sources of information, and tables, flow diagrams and numerous hand-drawn illustrations – used extensively to explain organogenesis and system development – support the concepts presented in the text. Thomas McGeady is former Dean of the Veterinary Faculty of University College Dublin. His academic career was spent in the Department of Veterinary Anatomy, Faculty of Veterinary Medicine, UCD, where he taught comparative embryology and developmental anatomy to veterinary students. His lectures and class notes provided the basis for many of the chapters in the first edition of Veterinary Embryology. PJ Quinn was Professor of Veterinary Microbiology and Parasitology and Head of the Department in the School of Veterinary Medicine, University College Dublin, from 1985 to 2002. He is the senior co-author of, amongst others Veterinary Microbiology and Microbial Disease (2nd edition 2011), and Concise Review of Veterinary Microbiology (2nd edition 2016). He was awarded the title Professor Emeritus by University College Dublin in 2002. In 2006, he was recipient of the Association of Veterinary Teachers and Research Workers outstanding teaching award. Eamonn Fitzpatrick is former Chief Technical Officer in the Department of Veterinary Anatomy, University College Dublin. He is a Fellow of the Institute of Biomedical Science, and taught veterinary anatomy and histology for over 25 years. He is co-author of Veterinary Microbiology and Microbial Disease (2nd edition 2011) and Concise Review of Veterinary Microbiology (2nd edition 2016). Marion Ryan is Senior Technical Officer and provides molecular biology support to the School of Veterinary Medicine, University College Dublin. She has published papers in a wide range of peer-reviewed journals encompassing the areas of veterinary and biomedical science education, animal genetics and host/pathogen interactions, having worked in the field of molecular biology and genetics for over 20 years. Patrick Lonergan is Professor of Animal Reproduction in the School of Agriculture and Food Science, University College Dublin. His main areas of interest are early embryo development in vivo and in vitro, embryo-maternal communication and understanding embryo mortality. He has supervised numerous Masters and PhD students and Post-doctoral Fellows. He has a large volume of refereed research publications, recognized by the award of a D.Sc. Degree from National University of Ireland in 2005 and his election to the Royal Irish Academy in 2012. He is former President of the International Embryo Transfer Society, and currently serves on the Editorial Boards of the journals Biology of Reproduction and Reproduction Fertility and Development. David Kilroy is College Lecturer in Veterinary Biosciences in the School of Veterinary Sciences, University College Dublin. He has previously taught anatomy and embryology to students of science and veterinary medicine at the Royal Veterinary College, London. He is co-author of the The Canine Abdomen for CLIVE (Computer-aided Learning In Veterinary Education)(2000).